Persistence - Notebooks in a notebook instance are stored on durable Amazon EBS volumes, but they do not persist beyond the life of your notebook instance. Storing notebooks in a Git repository enables you to store and use notebooks even if you stop or delete your notebook instance. Collaboration - Peers on a team often work on machine learning projects together. 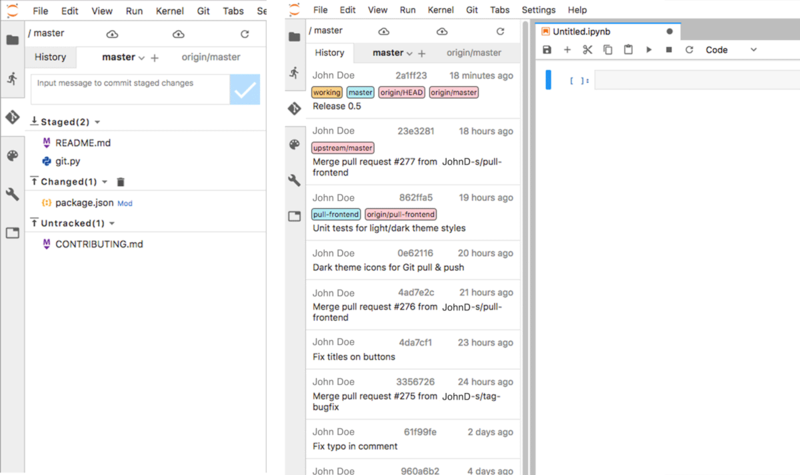 Storing your notebooks in Git repositories allows peers working in different notebook instances to share notebooks and collaborate on them in a source-control environment. Learning - Many Jupyter notebooks that demonstrate machine learning techniques are available in publicly hosted Git repositories, such as on GitHub. You can associate your notebook instance with a repository to easily load Jupyter notebooks contained in that repository. Add a Git repository as a resource in your Amazon SageMaker account. Then, to access the repository, you can specify an AWS Secrets Manager secret that contains credentials. That way, you can access repositories that require authentication. Associate a public Git repository that is not a resource in your account. If you do this, you cannot specify credentials to access the repository. To manage your GitHub repositories, easily associate them with your notebook instances, and associate credentials for repositories that require authentication, add the repositories as resources in your Amazon SageMaker account. You can view a list of repositories that are stored in your account and details about each repository in the Amazon SageMaker console and by using the API. You can add Git repositories to your Amazon SageMaker account in the Amazon SageMaker console or by using the AWS CLI. You can use the Amazon SageMaker API CreateCodeRepository to add Git repositories to your Amazon SageMaker account, but step-by-step instructions are not provided here. Choose Git repositories, then choose Add repository. To add an CodeCommit repository, choose AWS CodeCommit. For Repository, choose a repository from the list. Enter a name to use for the repository in Amazon SageMaker. The name must be 1 to 63 characters. Valid characters are a-z, A-Z, 0-9, and - (hyphen). Enter a name for the repository that you can use in both CodeCommit and Amazon SageMaker. The name must be 1 to 63 characters. Valid characters are a-z, A-Z, 0-9, and - (hyphen). Enter the URL for the repository. For Git credentials, choose the credentials to use to authenticate to the repository. This is necessary only if the Git repository is private. If you have two-factor authentication enabled for your Git repository, use a personal access token generated by your Git service provider instead of a password. To use an existing AWS Secrets Manager secret, choose Use existing secret, and then choose a secret from the list. For information about creating and storing a secret, see Creating a Basic Secret in the AWS Secrets Manager User Guide. For GitHub repositories, we recommend using a personal access token instead of your account password. For information, see https://help.github.com/articles/creating-a-personal-access-token-for-the-command-line/. To create a new AWS Secrets Manager secret, choose Create secret, enter a name for the secret, and then enter the username and password to use to authenticate to the repository. The IAM role you use to create the secret must have the secretsmanager:GetSecretValue permission in its IAM policy. For GitHub repositories, we recommend using a personal access token instead of your account password. To not use any credentials, choose No secret. For information about creating and storing a secret, see Creating a Basic Secret in the AWS Secrets Manager User Guide. The following command creates a new repository named MyRespository in your Amazon SageMaker account that points to a Git repository hosted at https://github.com/myprofile/my-repo". 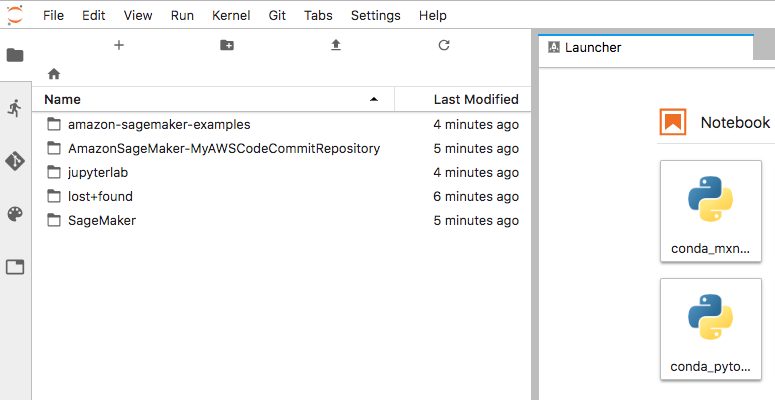 You can associate Git repositories with a notebook instance when you create the notebook instance by using the AWS Management Console, or the AWS CLI. You can use the Amazon SageMaker API CreateNotebookInstance to associate Git repositories with a notebook instance, but step-by-step instructions are not provided here. If you want to use a CodeCommit repository that is in a different AWS than the notebook instance,set up cross-account access for the repository. For information, see Associate a CodeCommit Repository in a Different AWS Account with a Notebook Instance. Follow the instructions at Step 1: Create an Amazon SageMaker Notebook Instance. For Git repositories, choose Git repositories to associate with the notebook instance. For Default repository, choose a repository that you want to use as your default repository. Amazon SageMaker clones this repository as a subdirectory in the Jupyter startup directory at /home/ec2-user/SageMaker. When you open your notebook instance, it opens in this repository. To choose a repository that is stored as a resource in your account, choose its name from the list. To add a new repository as a resource in your account, choose Add a repository to Amazon SageMaker (opens the Add repository flow in a new window) and then follow the instructions at Create a Notebook Instance with an Associated Git Repository (Console). To clone a public repository that is not stored in your account, choose Clone a public Git repository to this notebook instance only, and then specify the URL for that repository. For Additional repository 1, choose a repository that you want to add as an additional directory. Amazon SageMaker clones this repository as a subdirectory in the Jupyter startup directory at /home/ec2-user/SageMaker. To choose a repository that is stored as a resource in your account, choose its name from the list. To add a new repository as a resource in your account, choose Add a repository to Amazon SageMaker (opens the Add repository flow in a new window) and then follow the instructions at Create a Notebook Instance with an Associated Git Repository (Console). To clone a repository that is not stored in your account, choose Clone a public Git repository to this notebook instance only, and then specify the URL for that repository. Repeat this step up to three times to add up to three additional repositories to your notebook instance. Specify the repository that you want to use as your default repository as the value of the default-code-repository argument. Amazon SageMaker clones this repository as a subdirectory in the Jupyter startup directory at /home/ec2-user/SageMaker. When you open your notebook instance, it opens in this repository. To use a repository that is stored as a resource in your Amazon SageMaker account, specify the name of the repository as the value of the default-code-repository argument. To use a repository that is not stored in your account, specify the URL of the repository as the value of the default-code-repository argument. Specify up to three additional repositories as the value of the additional-code-repositories argument. Amazon SageMaker clones this repository as a subdirectory in the Jupyter startup directory at /home/ec2-user/SageMaker, and the repository is excluded from the default repository by adding it to the .git/info/exclude directory of the default repository. To use repositories that are stored as resources in your Amazon SageMaker account, specify the names of the repositories as the value of the additional-code-repositories argument. To use repositories that are not stored in your account, specify the URLs of the repositories as the value of the additional-code-repositories argument. If you use an AWS CodeCommit repository that does not contain "SageMaker" in its name, add the codecommit:GitPull and codecommit:GitPush permissions to the role that you pass as the role-arn argument to the create-notebook-instance command. For information about how to add permissions to a role, see Adding and Removing IAM Policies in the AWS Identity and Access Management User Guide. To associate a CodeCommit repository in a different AWS account with your notebook instance, set up cross-account access for the CodeCommit repository. In the AWS account that contains the CodeCommit repository, create an IAM policy that allows access to the repository from users in the account that contains your notebook instance. For information, see Step 1: Create a Policy for Repository Access in AccountA in the CodeCommit User Guide. In the AWS account that contains the CodeCommit repository, create an IAM role, and attach the policy that you created in the previous step to that role. For information, see Step 2: Create a Role for Repository Access in AccountA in the CodeCommit User Guide. Open a terminal in the notebook instance. Where CodeCommitAccount is the account that contains the CodeCommit repository, CrossAccountAccessProfile is the name of the new profile, and CrossAccountRepositoryContributorRole is the name of the role you created in the previous step. Where CrossAccountAccessProfile is the name of the profile that you created in the previous step. To open any of the additional repositories, navigate up one folder. The additional repositories are also installed as directories under /home/ec2-user/SageMaker. If you open the notebook instance with a JupyterLab interface, the jupyter-git extension is installed and available to use. For information about the jupyter-git extension for JupyterLab, see https://github.com/jupyterlab/jupyterlab-git.